I have long had a love/hate relationship with The Book of Marvelous Magic. When it was released in 1985, I gleefully purchased it -- despite its being for "kiddie D&D" -- because it carried Gary Gygax's name on the front cover. I was, at the time, a rabid Gygaxian fanboy and the mere presence of his name was enough for me buy products sight unseen, as well as to look more kindly on them than I probably ought to have. A lot of Gary's late TSR output is of a very different character than the stuff he wrote in earlier days. Some people like it; some don't. Even as a callow youth I recognized this, but I lacked the gumption to admit to myself that I was among the latter group. The end result was that I ended up with a lot of Gygax-penned products I wasn't really happy with. 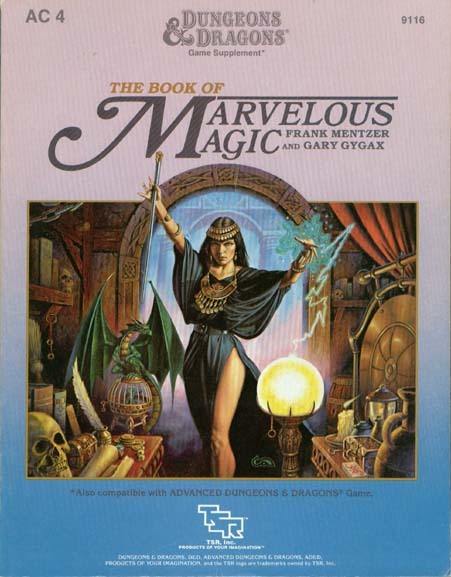 Of course, The Book of Marvelous Magic wasn't just written by Gary Gygax. He shares the cover byline with Frank Mentzer and the dedication (written by Mentzer) thanks a large number of people "for their contributions," among them Mark Acres, David Cook, Tracy Hickman, Doug Niles, Penny Petticord, John Pickens, Gali Sanchez, Carl Smith, Garry Spiegle, and Skip Williams. Who contributed what is never delineated in the book, but my suspicion is that Mentzer wrote the bulk of the book, using his own ideas and those offered to him by others, including Gygax. Gary's name is on the cover precisely because, even in 1985, it was still a draw to players like me, even though his contributions were probably minimal (more knowledgeable souls can correct me if I am mistaken). The Book of Marvelous Magic is a 80-page softcover book that details over 500 new magic items for use with Dungeons & Dragons (and AD&D -- more on that in a bit). These items are broken up into fourteen categories: amusements, animal-related items, apparel, cloth and related items, containers, foodstuffs, furniture, household items, jewelry and valuables, music instruments, oddities, paper and related items, tools and hardware, and travel items. Each of these categories has one or more percentile tables associated with it, to aid the referee in randomly rolling treasure. D&D magic items from the rulebooks are also included on these tables, which is nice. The items presented in this book would qualify as "miscellaneous magic items" and are a mixed bag. Some are extraordinarily mundane, while others are bizarre. Some have punnish or esoteric names (both suggesting Gygaxian involvement). The vast majority, though, are interesting enough, if only in that they're new. One of the problems of playing D&D with long-time players is that it's hard for them to get excited about a bag of holding or gauntlets of ogre power anymore, since, to them, they're "standard" parts of the game. Having a larger pool of magic items to draw upon is thus always a good thing and I suspect a big part of the appeal of books like Unearthed Arcana to many gamers. Over the years, my opinion of The Book of Marvelous Magic has been inconstant. After my initial excitement, I felt deflated, in large part because so many of the book's items simply reproduce the effects of a spell or class/race ability, while others are merely magical replacements for technology. Later, I came to appreciate the variety it offered, even if many of its offerings are less than inspired. Nowadays, I look on it more kindly, seeing it primarily as a fount of ideas from which I can steal -- and steal from it I have. The book concludes with an appendix, where rules and guidelines are given for using it with AD&D. Re-reading it today is interesting. The D&D and AD&D games are actually different games. Though both are role-playing games dealing with fantasy topics, many of the games' systems are entirely different. Each game contains spells, monsters, and other elements not found in the other. The D&D game is easy to modify to your individual taste. When revised and expanded (editions published in or after 1983), some details were added, but the game as a whole actually became easier to modify. You may add more details, or change existing ones, with little fear of upsetting the game system as a whole. Options are often mentioned, giving the DM a choice of styles or details. For example, a monster's poison can be deadly, but guidelines are given for the DM who wants to change this to points of damage (or other effects) to make the game more enjoyable. The AD&D game system is, as a whole, far more complex than the D&D game. Rules are given for more situations, and common situations are presented in more detail. Since the AD&D game is more complex than the D&D game, it is very difficult to modify properly. Any rule change may have far-reaching effects. Modifications usually involve very minor details, and rarely (if ever) change general principles. Additions must be compatible with existing details, and must thus be very carefully considered. Back in 1985, I'd have seen this section as a vindication of my preference for AD&D over D&D, whereas nowadays, it's just the opposite. Good post, Jim. Yeah, when I read that AD&D conversion section I has the same reaction ("waitaminute...it's so easy to port these items back and forth between editions..."). I suspect the reason being marketing; gotta keep the lines separate yet connect them juuuust enough to not tread on AD&D's market share. Or something like that. You could take that statement and replace words with Pathfinder, OD&D, DnD Next etc. The Book of Marvelous Magic was an excellent resource when paired with The Principalities of Glantri. I asked Frank about this book once, inquiring whether it was indicative of Gary's sense of humor. He confirmed the magic items therein were examples of the Lake Geneva sense of humor at its finest (or worst, depending on one's point of view). Interesting place to find that commentary! It's funny, even though I know you could do whatever you want with AD&D very easily, I still associate the Advanced version of the game with those pronouncements from on high, and it just leaves a bad taste in my mouth. As a result, I am much less amicable towards AD&D than it probably deserves. The Book of Marvelous Magic, followed by The Book of Wondrous Inventions (1987, Bruce Heard), I used both of them for ideas, though it's been quite some time. Need to look at them again. I have this book. I really wanted to like it, but I never once handed out any magic items from it. They always seemed more lame, more jokey, or more world-bending than I would have liked. Looking back on it years later, I found my feelings haven't changed much. It wasn't for the kind of game I was running then, or now. I've always liked the book, never found much use for it. I've had it since it first came out and still go back to it every so often then put it back on the shelf. Strange...I just happened to buy a copy of this book on Ebay this morning before I read your review. Products like this and the Gazetteer line of D&D stuff are one of the reasons I fell in love with D&D over AD&D. I didn't use all the stuff, but there were just so many ideas to be mined for future use. It might have been that I was not really playing all that much anymore by that point, so other than my Dragon subscription and any new official AD&D rulebooks, I probably wasn't buying any new accessories. Which is a shame... because this looks like it would have been something that would have really inspired me and seen at least moderate use at the tables I DM'ed at. I was always looking for new and different items to surprise my players with... since they all owned or had access to the rule books, and tended to view the magic items page of the DMG as the gaming version of the Sears Christmas catalog. That was the one area Unearthed Arcana really did get some use by me, since I had the sole copy, the magic items were still mysterious to my players. Of course it’s poppycock that AD&D is any less easy to modify than BECMI. In fact, in terms of what was published (in Dragon Magazine, etc. ), people added anything and everything to AD&D, whereas BECMI was always carefully constricted. There's a D&D add-on book that I've been attempting to find for the longest time. I used to think it was this one, or Unearthed Arcana, but the copies of these I've been able to get a hold of are not the ones I remember. The last few pages of the book I'm trying to locate mentioned something about a different type of fire called "blackflame" or something similar. It was supposed to be the opposite of regular fire; cool, gave off a bluish light, caused frostbite, etc. If anyone knows what the title of this book is, please reply to this comment. Sounds like the halflings racial clan artifact, the crucible of black flame. Might want to look in the Masters Set of Basic D&D. There might be reference to it in the Gazetteer on the Shire. So that's where the cover to Treasures of the Savage Frontier came from! (Which I completed on an underclocked Pentium 3 on satuday running... DOS 6!). Oops I meant Gateway to the Savage Frontier, Treasures is the one after, which I'm now working through. The book I'm recalling was devoted just to magic items. Thanks, anyway. I rather liked this book, especially the food-related items. I found D&D Magic item crafting allowed for incredible things - Like a Flying Ship that is more in keeping with a UFO with an inverted Crystal ball the size of a room where you Pilot from the inside and erect a view of the outside world...in some colossal view screen displaying in all directions. The Concept of this becomes War Rooms in Castles. The Ultimate Camera Obscura.